Any herbalist will tell you that many of our "weeds" can be our friends. Protecting yourself, your children or your pets against annoying insects doesn't have to mean using a product with a warning label. DEET, also known as diethyl-meta-toluamide, is very common in commercial bug repellent sprays, but research tells us that its use can have detrimental effects on brain cells and can interact with some medications. Anything put onto our skin is absorbed into the body, not something you want for yourself or your loved ones. Try a natural mosquito and fly repellent instead. Plantain, yarrow and comfrey are the chosen plants for this deet free herbal infusion insect bite treatment and deterrent. Plantain is a commonly seen weed and amazingly efficient at neutralizing the sting of bugs and bees. It has astringent, soothing, antimicrobial properties that make it a beneficial addition to this mix. 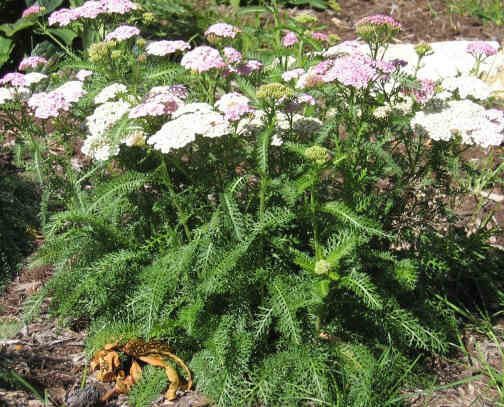 Yarrow is usually associated with the story of Achilles' using it to stop the bleeding wounds of his soldiers in battle. Its astringent, antiseptic and analgesic properties add up to it being a first aid kit in one plant. Another wonderful healer is comfrey, a large fuzzy garden herb. Rich in chlorophyll, minerals and mucilage the leaves are an ally for cooling and soothing irritated skin. Vinegar is the base for this spray for three reasons; bugs don't care for it, it makes for great herbal infusions, and it evaporates, therefore there is no need to worry about smelling like vinegar. Herbal Vinegar Insect Bite Treatment and Deterrent Body Spray is ideal for people who are seeking an organic, herbal product but would rather avoid the concentration of essential oils. We're relying solely on the strength of the herbs themselves. Spray your pet with this herbal vinegar as often as needed. Rub it into the fur so it gets down to the skin. Herb-based preparations must be reapplied more frequently than chemical repellents to remain effective. Avoid contact with the eyes. When applying to the head area, perhaps apply a bit to the palm of your hands and just rub it around the head area.